Have you ever splurged on a vacation only to return home feeling remorse over how much money you spent? You try to convince yourself that it was worth it, but the hotel, restaurants or sites didn’t quite live up to your expectations. Or perhaps the weather wasn’t what you had hoped for. The time flew by and now all you have to show for it is a few tourist photos and a big credit card bill. What if I told you there was a way you could avoid tourist traps and make your hard-earned vacation dollars last a lifetime? Have you ever thought about donating your vacation to a cause? I recently met an amazing woman who not only thinks about it, but she actually does it. 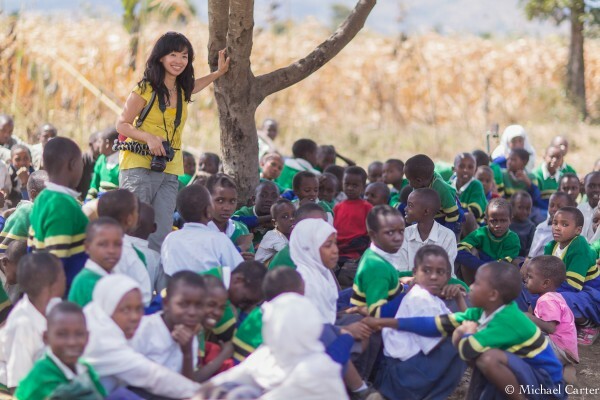 She’s the ultimate voluntourist who loves to travel to developing countries. 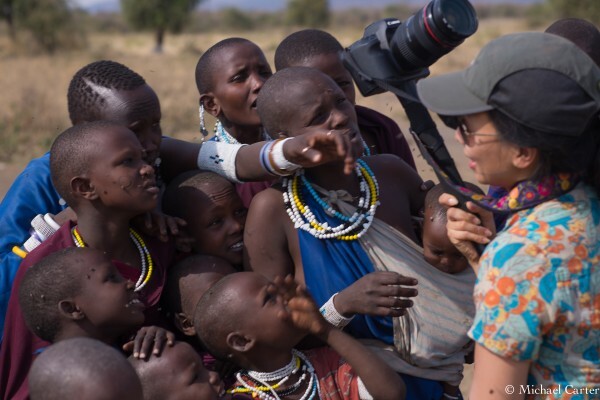 Offering her photography and education skills, she volunteers her summers to reach out to help people in rural communities in countries like Peru, China, Nepal and Africa. Why do you choose to spend your vacation time volunteering? I’ve always been fascinated about the worlds beyond where comfort is out of reach but I’m surrounded with plenty of simple beauty. Volunteering is the best way to enjoy this path less traveled. Whenever I give, I end up earning more and that fulfills my inner self. How did you apply your talents to help Asante Africa? With my previous volunteering experiences, photography skills and passion for education, I was invited by Art Director Heward Jue to pull together a project proposal for Asante Africa Foundation, a well established nonprofit based out of Oakland, CA. Subsequently, we were awarded the Getty Images Creative Grant of $20,000 which supports photographers who use imagery to promote positive change in the world. 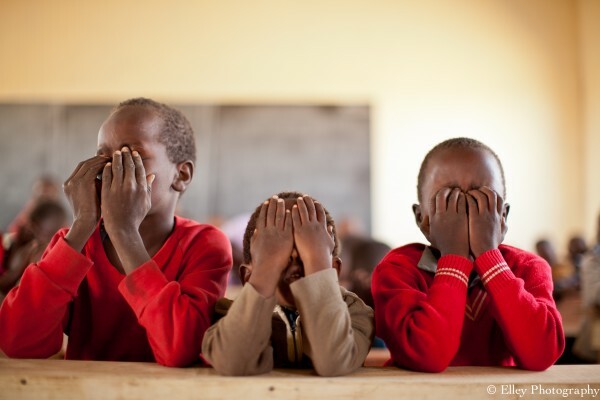 This grant helped us to actualize a film and print campaign for Asante Africa Foundation, showcasing how the work of the organization has profoundly transformed the lives of thousands of African children and their communities. In July 2013, Heward and I went to Africa to film scenarios that highlight the transformations made possible through education. Thanks to the local Asante Africa staff in Kenya and Tanzania, we were able to locate the resources we needed to make the filming happen. They went out of their way to help us with our production. For example, one staff member from Asante Africa knew people who worked in the hospital, so we were able to do a shoot in the facility. The children featured in the film were also carefully selected by the staff who knew the potential of the students, all recipients of Asante Africa scholarships. What challenges did you encounter during the filming? In one of the scenes we were looking for a rough neighborhood so we could portray the issue of child soldiers as a haunting reality in Africa. 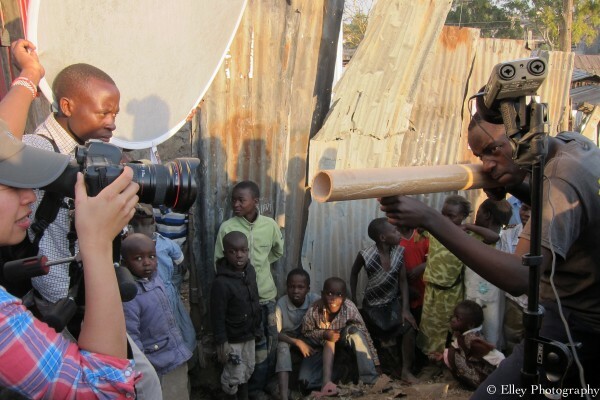 We felt uneasy about exposing ourselves and our equipment in the slum area while being barracaded by locals wondering what we were trying to accomplish there. Luckily, one of the staff members lived close by so he knew which people from the slum could help safeguard our visit. When we were filming at a local village, one of the male villagers gave us a hard time because the school principal affiliated with Asante Africa reported him for marrying off his daughter at a young age. After hours of negotiation our local staff was able to come up with a solution with them and we got to accomplish what we needed to do. What did you learn about Asante Africa? The thing that struck me the most about Asante Africa is that they have the best staff. The organization only hires local Africans. 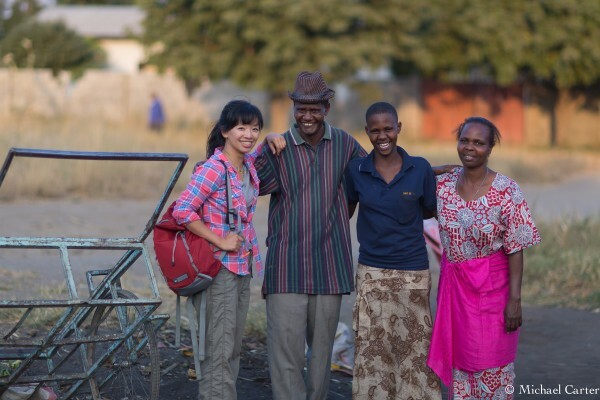 Their lives are empowered because of the job opportunities and training they’re given through Asante Africa. Not only are they super friendly, but these people are very dedicated to what they do. They aren’t afraid of trouble. Asante Africa addresses needs at multiple levels to ensure the communities at large will grow as they open more doors for students to have the education and skills to become future leaders. Not only do they build infrastructure to improve the physical environment of the schools, they also look at other needs of the community at large. They provide training programs for students to become future leaders, and programs to empower women to learn about women’s health, thus elevating their attendance in school. I learned that Africans are good problem solvers. They don’t get caught up in their emotions when dealing with hardships. They’re born into circumstances which teach them that life is difficult. They deal with what comes to them. They don’t give up easily. We saw barefoot children walking miles back to home after school. As our car passed by them, they waved at us with big smiles. They didn’t ask if we could give them a lift. They know what they deal with is part of life and they accept the challenge. What was one of the best things that happened during your stay in Africa? We met a boy on the street in a rundown neighborhood in Arusha as we were scouting for a location for the filming. He kept waving at us with a million dollar smile on his face. We couldn’t resist but to walk over. It turned out that he spoke good English and was able to answer all the questions we asked. He told us that he lived with his aunt and sister. “My father died. He kept throwing up every time we saw him,” he told us. We asked him where he lived. He couldn’t give us an address, but he told us to turn this way and that way and walk straight and so on. He said his favorite subjects were math and English and he wanted to be a pilot when he grew up. He said it all with full confidence on his face. When I looked into his bright beautiful eyes I couldn’t resist to believe that with a little help he could become a pilot. We talked to Albert, our scholarship coordinator, who proceeded to ask the boy more questions. After all was said and done, I asked Albert if this eight-year-old would qualify for Asante’s help. He said the boy met all the criteria and he would return do a home visit to get more information. This boy’s life may be forever changed, all because of his eagerness to give us a big smile. 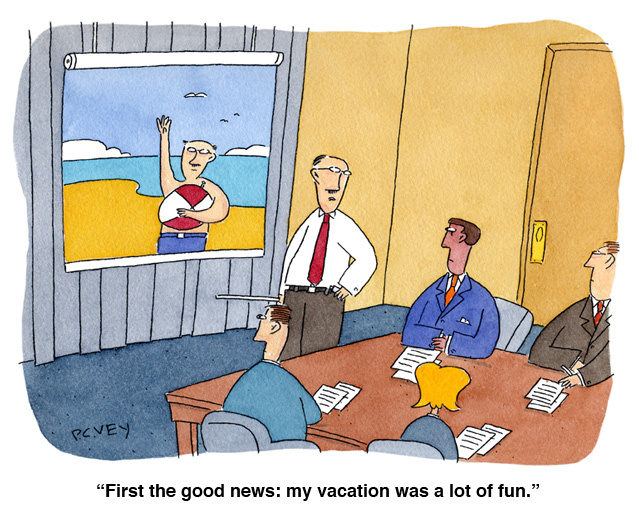 What advice do you have for people thinking about donating their vacation time to a cause? Go abroad and interact with the locals in their reality. Contribute what you can to the local communities. You’ll come back feeling you have done something way beyond what a typical beach resort vacation can offer. Who knows, you may even change a life for the better? Learn more about Elley’s experience from her perspective on her blog post: Getty Images Creative Grant 2013. Mike Carter is a board member of Asante Africa who helped out with Elley and Heward’s award-winning film project. If you’re like Mike, Elley and Heward and there’s a voice inside you telling you to go and make a difference, then do something about it. The next time you’re planning a vacation, check out your options with Global Vision International, The International Ecotourism Society or another similar voluntourism organization which offers trips starting at 7-10 days. Elley is a board member of the Nepal Education Initiative Organization and she welcomes you to go to the rural villages in Nepal to help out. Wherever you decide to go, do your homework to make sure you sign up with a reputable organization that’s a good match with your talents or interests. Your next vacation can be one that you and the locals will never forget. Who knows, it might even change your life for the better. Lorraine, WONDERFUL article. Good advice. I love it. Lorraine, this was a piece of advice that I hope will go viral. One has to just pack up and go to a place like that and do the volunteer thing to realize just how much we’re missing, and how much help one can be. I’ve worked in places like that and can tell you it changed my life for the better. I’ve never been the same, and I plan to get back there one day to continue. Keep posting these….it’s what many need to read. Thanks the feature on Elley and voluntourism (great word, btw). Elley is a wonderful human being with talent to match the size of her heart. She was a real trouper and joy to work with. Thanks to her love of photography, and more importantly, people, we were able to pull off an intricate production in the Third World and create a first-class product for a first-class organization.